This is a gorgeous, lacy, romantic gown. The fabric under the lace is darker than ivory and the lace creates an elegant sheer look. It is fitted through the bodice then flows out into an a-line. The cap sleeves and higher necklace are very classy with the open back. When I tried the dress on I added a belt but it’s totally optional. I loved this dress but ended up not wearing it because I found one I liked even better, for a great price. 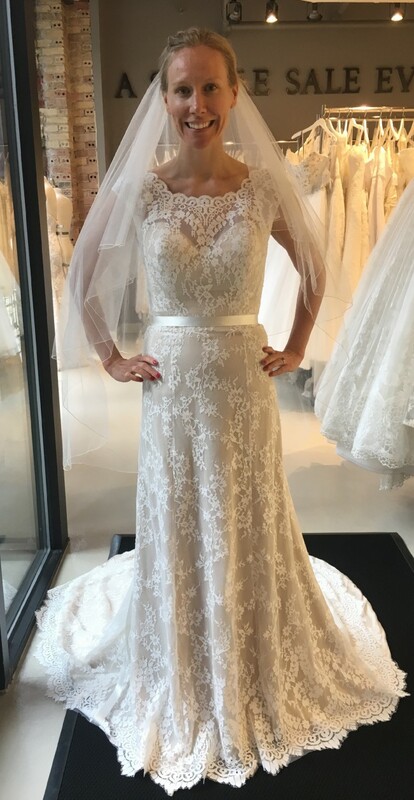 I didn’t get alterations so it is a size 12 and has not been altered. It is beautiful and I hope can be a dress someone loves for their special day!